We’ve finally put together a playroom for C. Now that he is on the move this playroom has been wonderful! We are fortunate that we have a “bonus room” in our house. Prior to turning it into a play space we had a couch, chairs, TV and exercise bike (which was rarely used) up there. We honestly never really used the room. Now it’s one of the most used rooms in our home. 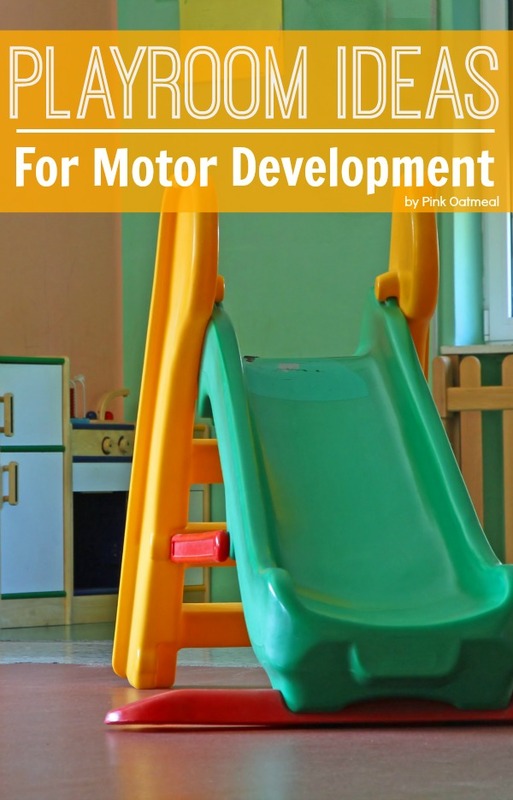 I wanted a play space that would promote motor development. I’m sure that this play space will evolve as my little guys motor skills change. Some things in the play space he is using all the time, and others he is not quite ready to use. Come take a tour (I cleaned up for it) and hopefully get some inspiration for your own play space! On one wall I have C’s train table set-up. Now that he is pulling to stand we use the train table to motivate him by placing toys on it. He has started to cruise a little bit along the train table. It’s the perfect height. I scored the table at a garage sale! I also have a push toy on this wall. 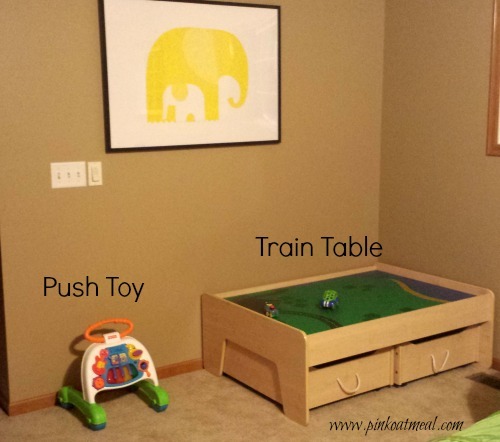 Make sure to see all the different ways a push toy can be utilized. C isn’t able to walk with the push toy yet, but it still gets plenty of use. Next up is the tunnel with tent. 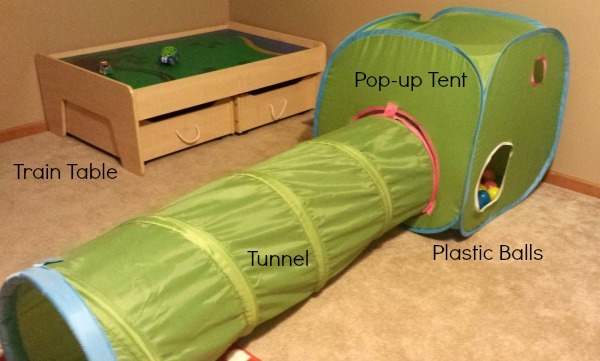 I absolutely love this set-up and so does C. He loves to climb through the tunnel and go in and out of the holes of the tent. I recently put playground balls in the tunnel and tent and it was a success! He loves rolling, pushing, and kicking the balls! 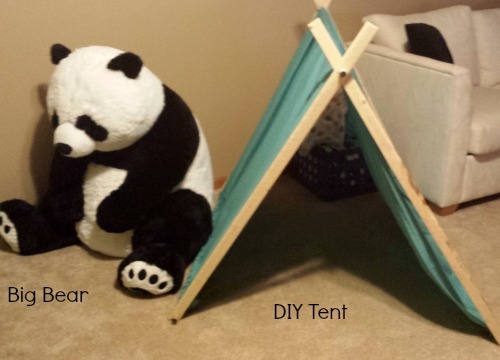 In this part of his playroom I have the DIY tent that I made for him. We will go in here and read and often times throw pillows or blankets in the tent that he can roll around in. I couldn’t decide where the big bear should go so I just stuck it in the playroom. Turns out C loves to climb up the bear so I kept it right where it was! 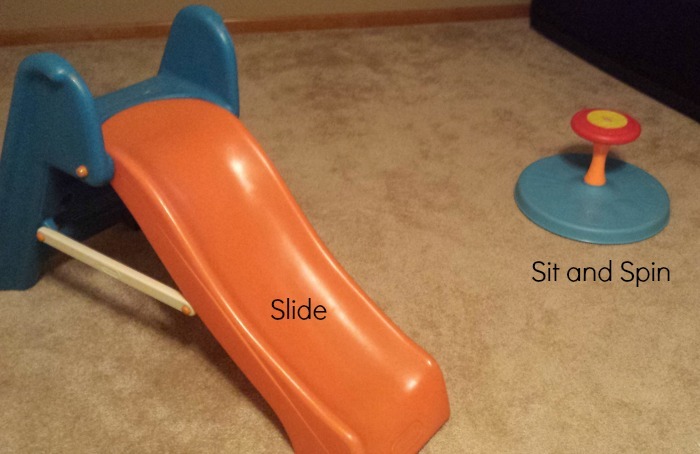 In this more open part of the play area I have a small slide and sit and spin. C isn’t old enough to utilize them as a slide or sit and spine. Instead we will place objects on the slide and watch them go down. He pulls up onto the slide with supervision. He will sit and move the sit and spin. Sometimes I will place something on the sit and spin so he can watch it move in a circle when he pushes it. I also have the basic toy storage where there are several different toys that he can access. 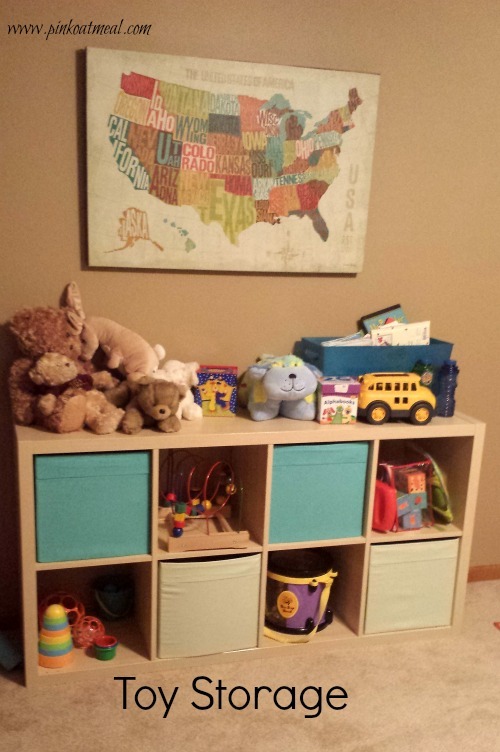 Some of his current favorites include blocks, stacker toys, and instruments. Finally I have a wall where I have his activity table. Which is his favorite toy. He LOVES it. It’s also one of my favorites and there are so many ways to use it even before a baby is able to stand. 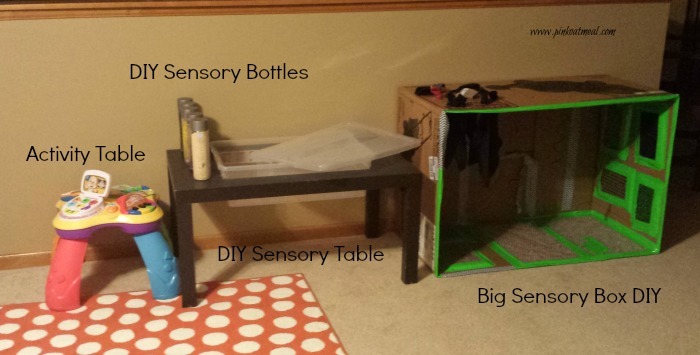 Next to that is his sensory table and bottles. He has just started pulling up to his table that I made out of an old IKEA side table. Then there is his big sensory box. He moves in and out of this several times in a day. I love how he can access so many sensory opportunities while moving! So that’s it! That is our current play space. What is your child’s favorite thing in their play space? These are all great ideas, thank you! Thanks for reading glad it helped! Thanks – I am a Nanny and I have some large boxes at my house!! Guess which active one year old boy is going to get a sensor box! !